He held out his hand and said, Come toward me. Leonard Bernstein died at 6:15 the following evening. That extract is from Jonathan Cott's Dinner with Lenny. The valedictory choice by the 'Kaddish' Symphony's composer of poetry by one of the most senior figures in the Sufi tradition takes us beyond syncretism to synchronicity. Deutsche Grammophon has recently re-released Dream of the Orient (that is the original 2003 Archiv CD above) on which Concerto Köln directed by Werner Ehrhardt and transcultural ensemble Sarband - celebrated for their Arabian Passion According to J.S. Bach - mix European classical and Sufi influenced Turkish music from the 18th century. Musical East meets West encounters continue to be fashionable, but their appeal is all too often multicultural rather than musicological. 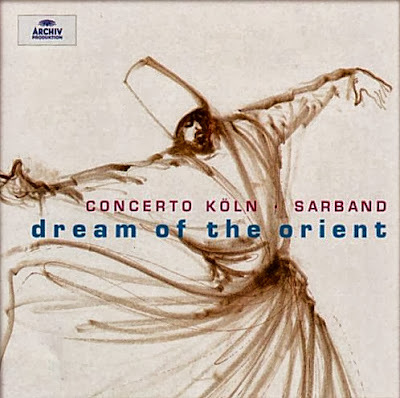 But, as you would expect from the musically impeccable Concerto Köln and Sarband, Dream of the Orient throws fresh light on Turkish indebted Western masterpieces such as Mozart's Die Entführung aus dem Serail when performed with refreshingly uninhibited Turkish percussionists. It is hardly surprising that 18th century Western classical music absorbed Eastern influences as the Turkish army reached the gates of Vienna in 1683 before being defeated. Leonard Bernstein also reached the gates of Vienna late in his career; but he avoided defeat and, predictably, the polyamorous conductor went on to have a passionate love affair with the Vienna Philharmonic. One of the fruits of this was the recording with them of his own transcription of Beethoven's op. 131 String Quartet which he cites in Dinner with Lenny as the record he was most proud of making. When once asked how he could love Wagner, Bernstein replied, “I hate Wagner — on my knees.” Despite this Lenny's performances of Wagner were acclaimed, which takes this post full circle as last year I asked Was Wagner a Sufi? Also on Facebook and Twitter. No freebies were used in this post. Any copyrighted is included as "fair use", for the purpose of study, review or critical analysis only, and will be removed at the request of copyright owner(s).